Silly as it sounds, the bike is easier to get up off the kickstand! Once underway, the bike definitely feels different. Not in a bad way, but just different. 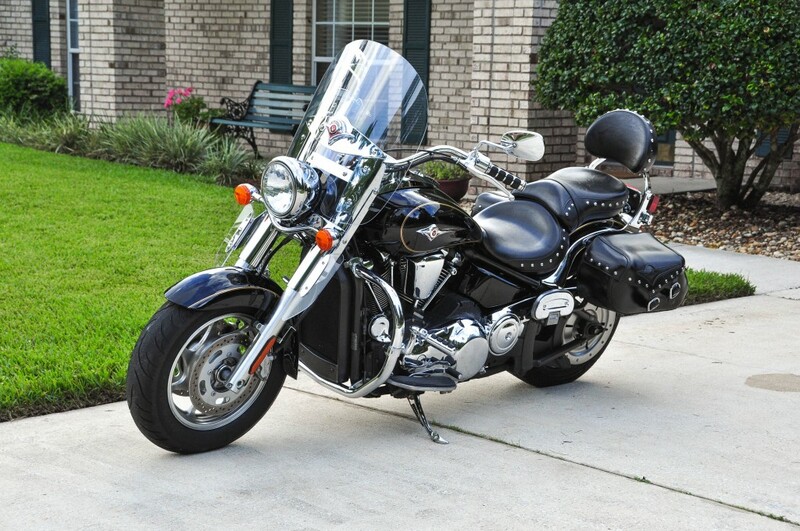 The bike is much easier to keep upright – in fact, it wants to stay upright. Want to ride with no hands? No problem, the bike just runs straight as an arrow. Disclaimer: The author does not encourage or promote riding a motorcycle without holding on to the handlebars. The corners require more counter-steering effort, and that took me some miles to get used to. But I like the feedback I get now when pressing on the handlebar during a turn. The Rogue was more responsive to counter-steering with the Bridgestone but sometimes I felt it was too sensitive. Now I feel more in control because more pressure is required. Let up and the bike comes upright on it’s own. And with the huge area in contact with the road, the tire just sticks! I love the solid feel. The ride seems a little smoother now. The tire is absorbing some of the bumps that were previously transmitted to my backside. I’ve got 25 PSI in it now, which others have said seems to be about right for 1-up riding. I’ll have to experiment a little myself. More to come as I get more miles on it. I have joined the ranks of Rogue owners who have gone to the Dark Side. 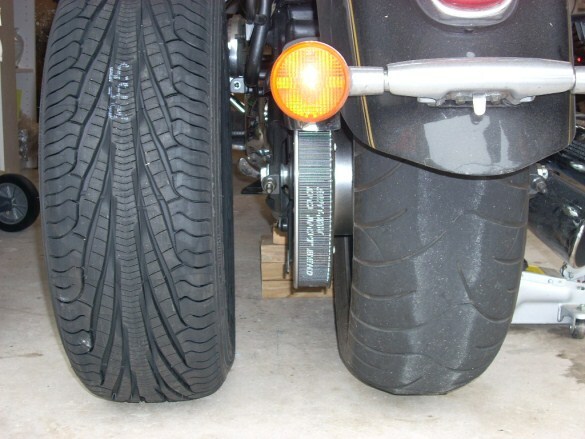 I have mounted a Goodyear Assurance Triple Tread 205/60-16 on my 2006 VN 2000 Classic LT.
After a considerable amount of research on the web, I made the decision to go to the “Dark Side”. Here are some good articles on running an automobile tire on a heavy cruiser. I have replaced the stock Bridgestone Battleax on my 2006 VN2000 Classic LT with a Goodyear Assurance Triple Tread 205/60R16. I went with that tire for several reasons. First, it seemed to be mentioned repeatedly by other riders who have already gone this route. Secondly, I have this tire on my car, and have been very pleased with it. It is an amazing wet weather tire. I live in Jacksonville FL and our summer rainstorms are torrential. The Assurance sticks to the road like glue. It is just incredible. Goodyear rates it as an 80,000 mile tire. I won’t get that much out of them – I’ve got 47,000 on them now and it looks like I’ll have to replace them somewhere between 55,000 and 60,000 miles. The Goodyear is considerably less expensive than the Bridgestone. Online prices for the Bridgestone BT-020 205/60R16 seem to be around $175-$185 dollars. I bought the Assurance TT for my Rogue at my local Goodyear store for $114.99 + tax. The fellow behind the counter made an interesting comment when I went in. He wasn’t even surprised. He said, “We’ve been getting a lot of motorcyclists coming in and buying that tire”. 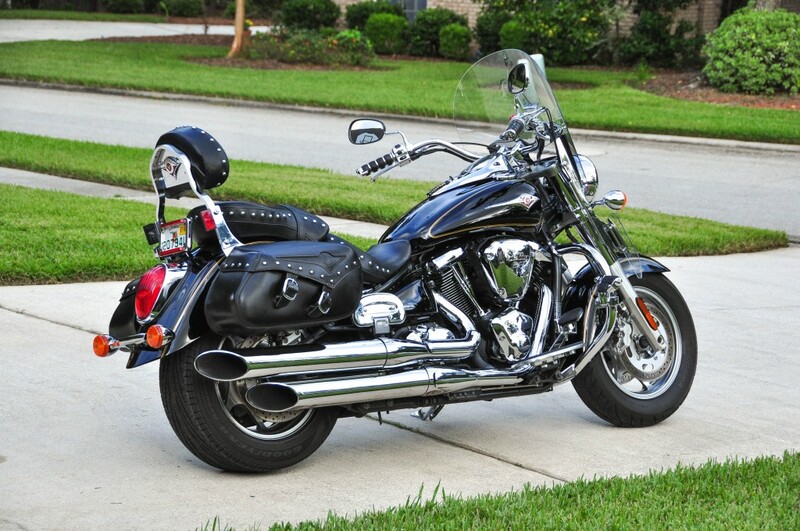 He asked me what I rode (turns out he rides a HD), and I told him a Kawasaki Vulcan 2000. He said most of the other people buying that tire rode Hondas, but couldn’t remember which model. I said “Gold Wing? Valkyrie?” and he said that sounded right. This seems to be almost a religious issue for some. What seemed significant to me was that I couldn’t find ANY posting online about someone who tried it and was so disappointed that they removed it and went back to a motorcycle tire. In fact, the opposite seemed to be more common. They tried it, liked it, and saw no compelling reason to go back to an MC tire. The auto tires are less expensive, last longer, offer better traction and arguably, an equally satisfying ride. I got 8100 miles out of the stock Bridgestone (which is better than some), but I enjoy long distance touring and did not want to be in a situation where I would have to worry about my tire lasting long enough to get me home. And finally, I wasn’t worried about my decision. If it turned out that I didn’t like the way the bike handled, I could always remove it, go back to a Bridgestone and I’d only be out the cost of the Goodyear.